Heat oven to 375°F. In large bowl, stir cookie ingredients until very soft dough forms (dough will be sticky). On ungreased cookie sheets, drop dough with 1 tablespoon-size cookie scoop or by tablespoonfuls about 2 inches apart. Bake 8 to 10 minutes or until edges are light golden brown. Cool 2 minutes; remove from cookie sheets to cooling racks. Cool completely, about 30 minutes. In small bowl, stir powdered sugar, lemon peel and lemon juice until smooth. Spread glaze on cookies. Sprinkle with crystallized ginger. 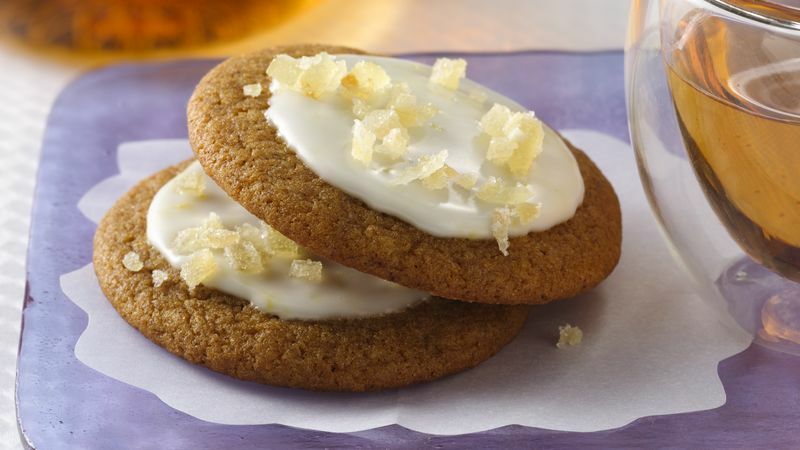 "It's fun and exciting to take Betty Crocker® sugar cookie mix and turn it into something like a ginger cookie." Crystallized ginger is fresh gingerroot cooked in a candy syrup and coated with coarse sugar. Look for it next to the fresh herbs in your supermarket.